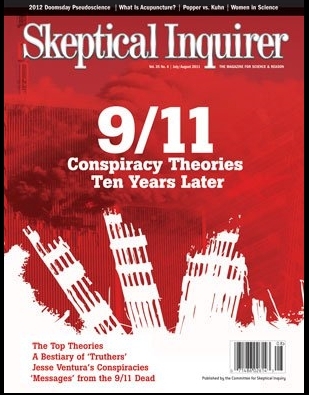 Most of the upcoming July/August issue of Skeptical Inquirer is devoted to analyses and discussion of 9/11 Truth and 9/11 conspiracy theories. I've an article about the top three claims of the Truth Movement: "near-freefall" collapse of the towers, thermite and melted steel, and the enigma of WTC 7. It should be coming out soon, but I'm announcing it now, so all our truther friends can start working up a good sweat. FYI, JREF, Mackey, Gravy, Sunstealer et. al. are all cited. Last edited by DaveThomasNMSR; 9th June 2011 at 10:42 AM. Reason: NWO orders! Hope Gravy pops in and weighs in. I miss him giving parky those scoldings. Great, I will check it out. Noted with interest. I will follow up. Got my advance copy in the mail! And that means the issue will be hitting mailboxes and better bookstores soon! Will it be possible to order this issue online, or is it part of a yearly subscription? Looks like you can get subscriptions online, but not individual issues. I would look for it at the better news-stands, having a variety of periodicals. I purchase my copy at Books A Million, but have also seen it in other large book stores. With a great deal of luck, such specialty mags are found at international airports or major train stations. "Galileo wrote to Kepler wishing they could have a good laugh together at the stupidity of 'the mob. '; the rest of his letter makes it plain that 'the mob' consisted of professors of philosophy, who tried to conjure away Jupiter's moons, using 'logic-chopping arguments as though they were magical incantations." In our day, the "mob" consists of skeptics, debunkers, Bush crazies, the mainstream media etc. who attempt to conjure away free-fall, Newton's third law, and physical evidence with the same 'logic-chopping arguments'. pomeroo: "Mark, where did this guy get the idea that you talked about holding aluminum in your hand?" Undesired Walrus: "Why, Ron, Mark mentioned this on your very own show!" You think you are clever, because you can write the names of some clever men of the past, right? 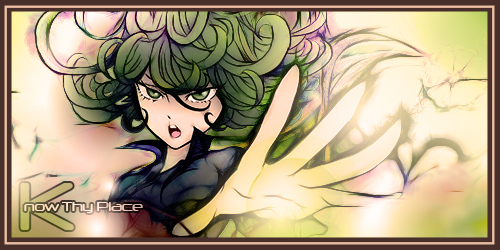 You think that by invoking their names, their power and prestige is bestowed upon you? Or do you plan to present an argument sometime and support it with well-sourced evidence and logic? State Newton's third law, and apply it to anything that happened on 9/11. State and source what you observed, explain how you model these observations, apply Newton's third law to that model (if applicable; if not, you already lose), and do the math. Draw conclusions from your work! Prediction: You will fail on the first step already. They're big at nano-tech. We could bring some termites. You can't conjure away something that is not in evidence. However, a number of truthers have attempted to conjure away such things as fire, gravitational potential energy, phone calls from victims on the planes, and even the victims and planes themselves. Tanabear, all your comments are showing us is that you haven't read my article, because it indeed does discuss free-fall, Newton's 3rd law, physical evidence, and more (especially conservation of momentum) in great detail. If you're going to criticize it (the S/I special 9/11 issue IS the topic of this thread, after all), perhaps you should at least read the thing first. Subscribed! I'd been meaning to for quite a while, since I get their e-newsletter and read their online articles often. Yay, lots of good stuff to look forward to! Worth a mention that Michael Shermer of skeptic.com has asked me to write an article for his mag too. Not sure if it's being published, but for those who don't know me, I debated Richard Gage on March 6. The debate was videotaped but they decided against making it available to the public. I'm about to release about 20 YouTube videos with the main points, and a boiled down version of that ,may appear in skeptic.com. Oddly, I noticed that Easons in Dublin have it, the previous issue at least. I'll get this one when it arrives. What I find most amusing is that he obviously knows SFA about Galileo, the man who denied comets, and the scientific method. Had an absolutely insane personal encounter today that I'm still having difficulty processing, because it was the sort of display of flagrantly irrational, histrionic and emotional behavior that we as atheists and rationalists criticize, but which you in fact rarely get to experience right in your face. It reminded me of a great many basic axioms though. For one thing, being an atheist is no guarantee you'll come with rationality pre-installed. For another, it never fails that people who have fanatical views that they refuse to see challenged will be the first to praise themselves as beacons of reason. It's a human flaw I suppose we must all watch out for. So I'm at a nearby mall today, when I pass by a fellow — who Shall Remain Unnamed — who, many years ago, used to be an ACA member. He left a while back, to the disappointment of few, it must be said, and I recall not liking him much personally for some prima donna behavior he exhibited in regards to the TV show at the time. But anyway, I caught his eye and decided it never hurts to be friendly, so I waved and said hi. I soon had cause to regret my sociability. We spoke for a moment, and everything was gas and gators. Then he demonstrated that, since leaving the ACA, he's travelled to a much weirder place, by turning the conversation towards — are you ready? 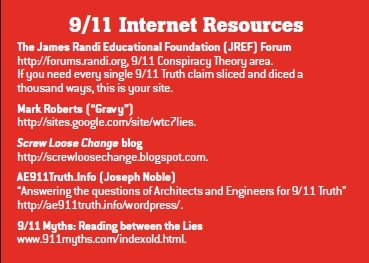 — 9/11 conspiracy theories. Basically, he buys them. So the guy shows me the new issue of Skeptical Inquirer, and indignantly denounces its cover story debunking 9/11 conspiracy mongering as "propaganda." He then goes on to speculate that the Center for Inquiry has been infiltrated by the CIA, who planted the story in the magazine. (He did not, in his genius, consider that if the CIA was doing this sort of thing, they certainly have the wherewithal to plant such a story in bigger and better-selling publications than Skeptical Inquirer, whose global circulation is around 50,000, compared to, say, Time's 3.3 million.) Anyway, it was a farrago of absurdity, and I could tell he was passionate about it. "It should be coming out soon, but I'm announcing it now, so all our truther friends can start working up a good sweat. " The best you can hope for it stopping a few people from falling into the truther cess pool. Excellent research, and some great articles. Here's the skinny on these amazing individuals. Perhaps you could address the topic? The link you posted has nothing to with the current article, except for being published in the same periodical. Can you find fault with the current issue and if so, please show us your rebuttal. I bought the latest issue of "Skeptical Inquirer" today. They have a hate and lie piece by someone named "Dave Thomas", no doubt not his real name, about the 911 Truth Movement.. The title is "9/11 Conspiracy Theories Ten Years Later" with it featured on the front cover in red and white to catch the most attention of the gullible and ignorant. I'm already seeing some very bad and stupid mistakes about the science of 911 in the piece which I'll report on later here on TS in about a week. But they must think the American people are soooooo stupid to swallow this garbage and they must be getting desperate because this magazine did another hate and lie piece on the 911 Truth movement only a few months ago. But in about a week I'll point out some of the errors and lies, one of which is so bad that even a 5 year old child can clearly see it's a lie. The OP has spewed more hate than any magazine possibly could. Say it ain't so, "Dave", say it ain't so! Agent #132214, they have figured out that your real name is Nigel Winchell Orwell. Begin sub-protocol Delta-Echo-Romeo-Papa immediately. The mouse is in the maple syrup... the cat is content! Twit, don't you realize this is in violation of directive NWO-SNAFU-BLOG-59f, regarding mentioning sensitive information on public blogs? You know the OWO owns the NWO. This is not a post by the OWO. Mongo no longer with us. Which goad-hook are you using? Puzzled, though - Mongo is still with us! First Significant Correction: Yes, Virginia, there HAS been a Thermitic CD! Thermite is simply not practical for carrying out a controlled demolition, and there is no documentation of it ever having been used for that purpose. On page 38 you say "Thermite is simply not practical for carrying out a controlled demolition, and there is no documentation of it ever having been used for that purpose." In fact, there was one. 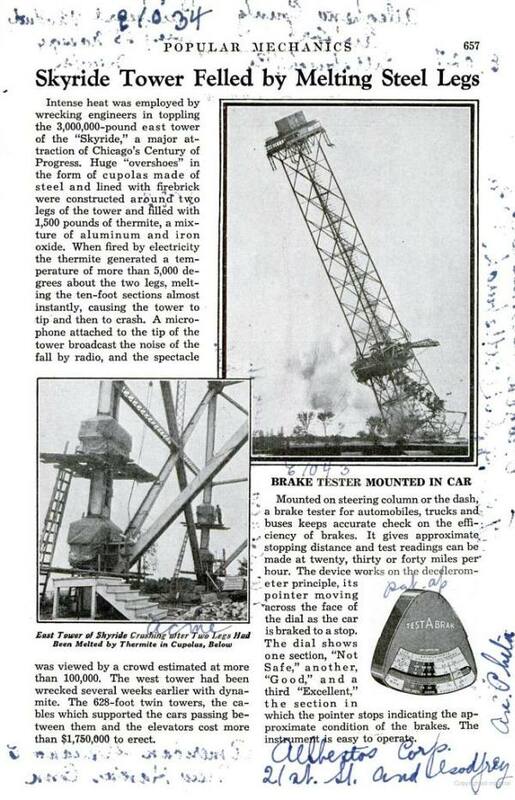 In 1933/34 Chicago held a World's Fair, A Century of Progress. One of the attractions was something called "The Sky Ride." Two 600+ foot tall towers supported cars which passengers rode between them at the 200+ foot level. After the Fair completed it's run the towers were razed. The West tower was brought down by dynamite, the East by thermite. Look at the Wikipedia entry for the Sky Ride. I am glad to learn of this. It took a lot of thermite, by the way, for just two beams! Thanks, Joe! Last edited by Locknar; 14th July 2011 at 10:24 PM. That's a good find, Dave. And yes, that is a significant correction. So it has been used in the past. Good to know; I'll have to remember that. And: 1,500 lbs, huh? Yeah. I'll bet the excuse given now will be "But it wasn't nanothermite!" Interesting. Though what's even more interesting, at least to me, is that none of the twoof movements (alleged) scientists, engineers and experts had discovered this example either. I can't imagine why either.